Source: Produced in E. coli. Active Matrix Metalloproteinase-1 (MMP-1, interstitial collagenase, fibroblast collagenase) catalytic domain from human cDNA. The enzyme consists of the catalytic domain of human MMP-1 (Phe100-Gln268) with a C-terminal purification tag. Formulation: Liquid. In 50mM TRIS, pH 7.5, containing 5mM calcium chloride, 300mM sodium chloride, 20µM zinc chloride, 0.5% Brij-35, and 30% glycerol. Activity: Preincubation of MMP-1 catalytic domain at 0.7 nM with the broad-spectrum inhibitor GM6001 (Prod. No. BML-EI300) at 20nM for 1 hour completely inhibits enzymatic activity. Specific Activity: ≥700 U/µg. One U=100 pmol/min at 37°C using the colorimetric thiopeptolide Ac-Pro-Leu-Gly-S-Leu-Leu-Gly-OEt (100 µM; Prod. No. BML-P125) as substrate. Use/Stability: The enzyme is stable on ice for at least several hours. However, it is recommended that thawing and dilution of the enzyme be done within as short a time as possible before start of the assay. Note: When stored under the recommended conditions, this enzyme is stable at the concentration supplied, in its current storage buffer. Procedures such as dilution of the enzyme followed by refreezing could lead to loss of activity. 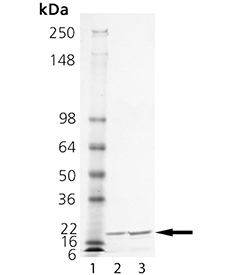 Scientific Background: In an SDS-PAGE gel, the enzyme runs as a doublet (<20 kDa). The higher band represents the polypeptide described above, while spontaneous cleavage of the tag results in the lower band. Both species possess identical enzymatic activities. SDS-PAGE Analysis: Lane 1: MW Marker, Lane 2: 1 µg, Lane 3: 2 µg MMP-1.